Jerlani Robinson gathers runs during his half-century in St Lucia yesterday. Beausejour yesterday. Despite half-centuries from the experienced Devon Smith and rookie Jerlani Robinson the Volcanoes slumped from 136-1 to 216 all out after Tea. The 23-year-old Beaton bowled with good pace on a track with a tinge of grass and got support left-arm seamer Raymon Reifer (2-41). Smith stroked a confident 87 from 190 balls, 225 minutes with 11 fours and shared in a 120-run second wicket stand with Robinson whose 57 lasted 82 balls, 149 minutes with seven fours and a six, but only Sunil Ambris (19) and Skipper Liam Sebastien (13*) of the others got into double figures. 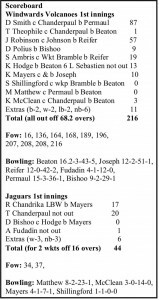 By the close the Jaguars reached 44-2 still needing 173 runs to reach the Volcanoes total with Tagenarine Chanderpaul (20) and Assad Fudadin (1) at the crease. Rajendra Chandrika was trapped in front for 17 by Kyle Mayers at 34-1 and night watchman Devendra Bishoo was removed by Mervin Matthew for a duck three runs later as Volcanoes new ball attack erupted with a generous dose of short-pitched bowling. 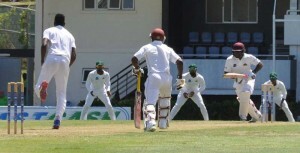 Devon Smith drives Ronsford Beaton during his 51st First-Class fifth and 11th against Guyana yesterday. with a flowing off drive off of Joseph and followed it with an expansive extra cover drive for a second boundary in the over. Tyrone Theophile (1) batted for 40 minutes before an impetuous top-edge pull off Beaton was taken by Chanderpaul running back from short-leg as the Volcanoes lost their first wicket in the ninth over at 16-1. The left-handed Smith stroked Keon Joseph gloriously down the ground for four and majestically drove through cover for another boundary when Joseph was switched to the Northern end. The Berbician pacer was a part of the Guyanese attack which was slaughtered by Smith when he made his highest First-Class score of 212 in Grenada. Robinson, who made his debut against Guyana last year in Dominica, got going with a confident off-drive off left-arm seamer Reifer as Smith dominated the partnership against disciplined bowling by the Jaguars. Robinson edged the lively Joseph, who tested him with a few short balls, to the vacant third man boundary before Smith reached his 51st fifty and 11th against Guyana from 95 balls, 108 minutes with seven fours. By Lunch the hosts were 68-1 with Smith on 50 and Robinson on 13 after Skipper Leon Johnson employed a four-prong seam attack for the entire first session. After the interval Robinson smashed Veerasammy Permaul sweetly to the cover boundary and then swept him for four off the next ball. He then hammered Beaton for consecutive boundaries as he looked very compact. Smith pulled Beaton for four, while Robinson danced into Permaul and dumped him down the ground for six. 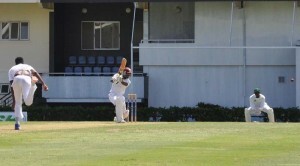 Robinson, who was dropped by Permaul at short cover off Fudadin with a full blooded drive when on 13, reached his maiden fifty with a four off Reifer. His 50 lasted 146 minutes, 77 balls with eight fours and a six. The second wicket stand was broken when Robinson edged Reifer to Johnson at slip at 136-2 and St Lucian Dalton Polius joined the well entrenched Smith and together they carried the score 164 before Polius (9) was bowled by Bishoo. Smith was taken brilliantly at short leg by Chanderpaul off Permaul for 87 as the Volcanoes lost two wickets in the space of four runs to slip 168-4 and by Tea the Volcanoes had reached 173-4 with last round centurion Kavem Hodge and Sunil Ambris at the crease. After Tea the Volcanoes lost their remaining six wickets for just 43 runs as Beaton took four wickets including two in two balls, while Joseph and Reifer picked up the others. Today’s play will commence at 10:00hrs.